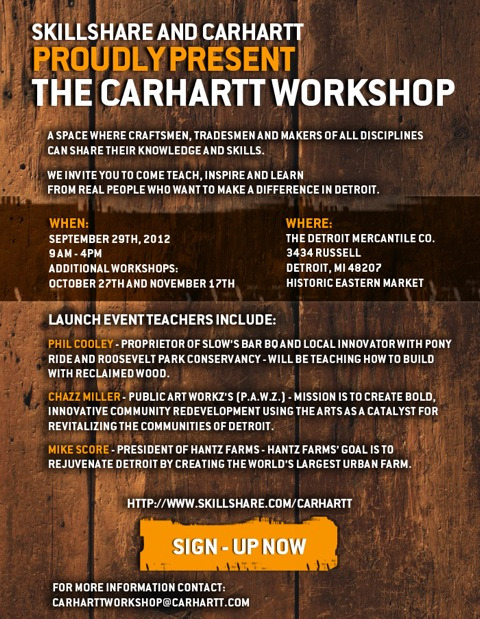 This Saturday (Sept 29th) starts the first of The Carhartt Workshop – three workshop days at Detroit Merchantile, presented by Skillshare and Carhartt. Each workshop day is filled with several classes taught by local experts in all sorts of making, crafting and artistry, and is sure to be inspiring! Saturday’s classes are Building with Reclaimed Materials taught by Slow’s Bar-BQ own Phil Cooley, Designing and Planting a Woodlot by Mike Score of Hantz Farms, and Learning to Paint Large Scale Murals by Chazz Miller of Public Art Workz. Classes are completely free. For more information and to reserve a spot in each class, visit Skillshare online. More workshops are scheduled for October 27th and November 17th – we’ll post more about those workshops as the deets are announced!